Al Ewing should teach a masterclass in how to write a crossover tie-in issue. Inevitably, almost all the books he writes for Marvel end up tying in to the latest crossover, but Ewing manages to weave them in nearly seamlessly and incorporate a lot of great characterization and awesome moments along the way. U.S.Avengers is no exception. Not even eight issues in and it’s already right in the middle of Secret Empire. But that’s not stopping Al Ewing and artist Paco Medina from doing a deep dive into one character: Toni Ho, the daughter of Ho Yinsen, the man who saved Tony Stark’s life. 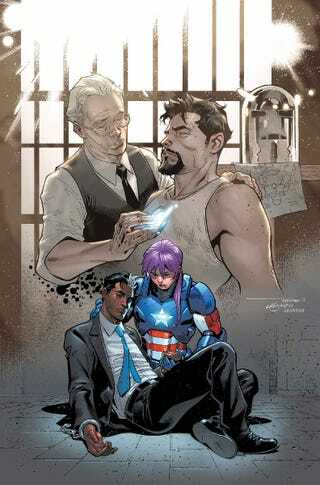 Toni was the Iron Patriot in the U.S.Avengers right up until Secret Empire and then she was captured and put in a cell with Bobby da Costa...who was been shot in the head and is now dying. Yes, she was put in pretty much the same situation as her father, imprisoned and watching a billionaire slowly die. But this time, perhaps even worse, since they were imprisoned by Hydra, nobody had given them any scraps to make armor with, and Bobby himself was nearly catatonic due to his condition. The issue, called “I Was Once Where You Are Now,” starts with a flashback to Toni’s childhood, where she learns that her estranged father died. Toni grows up with a resentment against Tony Stark due to her father’s sacrifice, but as she figures out a way to save Bobby, she realizes that she has to do the same thing as her father: buy him time by distracting the guards, possibly with her life. And so she makes the most awesome speech possible. And that’s why Toni — and Al Ewing — is awesome.